Over the last few weeks, there has been a significant amount of rain in our area and even more upstream to our north. 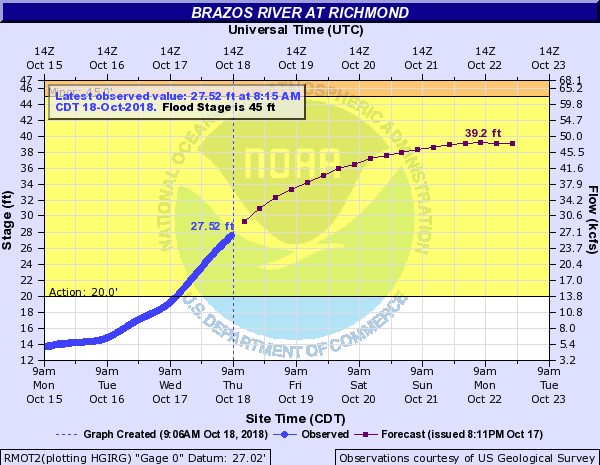 As such, river projections are increasing on the Brazos River, and the board wanted you to be aware. Today (10/18), the forecasted crest stands at 39.2 feet. An anticipated crest approaching 40 feet will seal off gravity flow to the pump stations. This action means all rainfall that occurs this week (or until the Brazos River gauge recedes below 40 feet) will be pumped out of the area. We do not anticipate any issue with the storage capacity inside the district. How are the pump stations? All of our pump stations are fully operational and prepared for the potential 2-4” of rain expected over the next week. There is no expectation of any issues or concerns over this event. We will not provide another update on this storm unless the conditions on the Brazos change. During the monthly Levee Improvement District 15 (LID 15) meeting, the directors approved periodic mosquito spraying to begin in October. The vote was unanimous. While this is not a required activity of the LID, the board believed that it was an action within their purview due to mosquito development from LID 15’s drainage and water detention facilities. The board opted for a monthly relationship with BUGCO Pest Control (Richmond, TX). This is the same company that sprayed after Hurricane Harvey. The spraying will take place weekly in October; then the board will decide each month as to the need. As the weather cools, mosquitos are less frequent. Additional resources for LID activities can be found of the official LID 15 website (www.FBLID15.com). Do you want to find out more about flood risks and flood insurance? Would you like to learn more about how flood forecasts and warnings are formulated? Do you want to understand our watershed better? The National Oceanic and Atmospheric Administration (NOAA), in its effort to improve public education surrounding flooding, has developed a FloodWarn Seminar to improve residents’ education. Joining NOAA will be representatives from the National Weather Service (NWS), Fort Bend County Drainage, Harris County Flood Control, and the Federal Emergency Management Agency (FEMA). The event will cover a wide range of topics, including home ownership issues that address risk and flood insurance. Participants will also discuss the forecasts and warnings that come from the NWS, and they will explain how water flows through our watershed. For more information, please contact the Fort Bend County Office of Emergency Management at (281) 238-3413 or email charity.dominguez@fortbendcountytx.gov. Or you can contact the National Weather Service at (281) 337-5084 ext. 228 or email katie.landry@noaa.gov.